The consumption of mineral fertilisers in Slovenia was reduced by 28.9% in the period 1992-2008. The consumption of nutrients (N, P2O5, K2O) per hectare of utilised agricultural area was also reduced from 135 kg/ha to 105 kg/ha, or by 22.1%. In the period 1992-2008 we used 64 kg N, 31 kg P2O5, and 39 kg K2O in average per hectare of utilised agricultural area. The indicator represents the consumption of mineral fertilisers in Slovenia in the period 1992–2008. Their total consumption and the consumption of major plant nutrients (nitrogen, phosphorus, potassium) are presented. The consumption of mineral fertilisers per hectare of utilised agricultural area has been calculated and the comparison made with some EU Member States in the period 2002-2007. Mineral fertilisers are substances in various aggregate states which contain nutrients and are added to soil or plants to improve growth, increase yields, raise the quality of crops or soil fertility and are obtained with industrial procedure (Mineral Fertilizers Act, OG RS, 29/06). Statistical Office of the Republic of Slovenia, 2009; Food and Agriculture Organization, 2009. The consumption of mineral fertilisers in Slovenia was reduced by 28.9% in the period 1992-2008. Reduced consumption has been noted particularly after the year 1999, as more than 180,000 tons of mineral fertilisers were used that year, and only 135,000 tons in 2008. The consumption of mineral fertilisers per hectare of utilised agricultural area in the quoted period was reduced from 342 kg/ha to 274 kg/ha, or by 19.8%. The consumption of nutrients (N, P2O5, K2O) was also reduced - from 135 kg/ha to 105 kg/ha, or by 22.1%. In the period 1992-2008, 64 kg N, 31 kg P2O5 and 39 kg K2O per hectare of agricultural land was used on average. The prevailing element among plant nutrients composing mineral fertilisers is nitrogen (48%), followed by potassium (29%) and phosphorus (23%). This fact confirms that mineral fertilisers in Slovenia are used primarily for side dressing with nitrogen (KAN and urea), while fertilising with phosphorus and potassium is combined with the use of livestock manure in the pre-sowing treatment of soil. The decrease in consumption of mineral fertilizers per hectare of utilised agricultural area is attributable to the Nitrates Directive requirements and the principles of good agricultural practice in manuring, to which farm holdings are committed in the last few years, especially after we joined the EU in 2004. Both papers devote more attention to the use of livestock manure and the assessment of plant nutrients in livestock manure in planning the fertilisation with mineral fertilizers. Since farm holdings must elaborate fertilising plans which contain the assessment of plant nutrients from livestock manure, the consumption of mineral fertilisers has been decreasing accordingly. The consumption of nutrients (N, P2O5, K2O) per hectare of utilised agricultural area during 2002-2007 was higher in Slovenia than in other EU Member States. The average consumption of nutrients (N, P2O5, K2O) was 126 kg/ha in the period 2002-2007 in Slovenia, while in the EU-27 it was 98 kg/ha. The consumption of nutrients in old Member States (EU-15) was basically higher than in the new Member States (EU 16-27). In the EU-15, the average consumption of nutrients in the period 2002-2007 was 106 kg/ha, and in the EU 16-27 it was 83 kg/ha. Objectives summarized by:the Resolution on National Environmental Action Plan 2005-2012(ReNEAP, OG RS, No 2/06), the Rules concerning good agricultural practice in manuring (OG RS No 130/04) and the Decree concerning the protection of waters against pollution caused by nitrates from agricultural sources (OG RS No 113/09). Source database or source: The Statistical Office of the Republic of Slovenia, SI-STAT data portal (Environment and natural resources> Agriculture and fishing > Consumption of Fertilisers, Pesticides, Water, Energy > Fertilisers > Agricultural consumption of mineral fertilisers). Data on mineral fertilizers and plant nutrients used by enterprises, companies and cooperatives in the growing season, as well as data on stocks of fertilizers held by producers on 31 December of the current year are obtained by the Statistical Office once a year through questionnaires filled in by all enterprises engaged in crop production. Data on imports (sales) of mineral fertilizers for crop production and plant nutrient content in some mineral fertilizers are collected directly from import companies through annual questionnaires. Mineral fertilizers are classified according to the Nomenclature of Industrial Products, and the unit of measure is "kg of active substance" (kg of plant nutrient), or kg of mineral fertiliser. Data processing methodology:Data on the consumption of mineral fertilizers and plant nutrients are calculated on the amount of used mineral fertilizers and plant nutrients (N, P2O5, K2O) per hectare of utilised agricultural area. 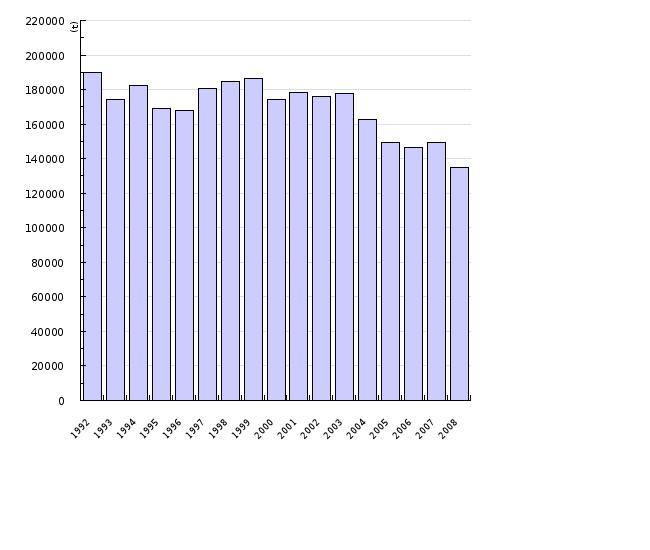 Data are processed per each year (1992-2008), and the average values are also calculated. 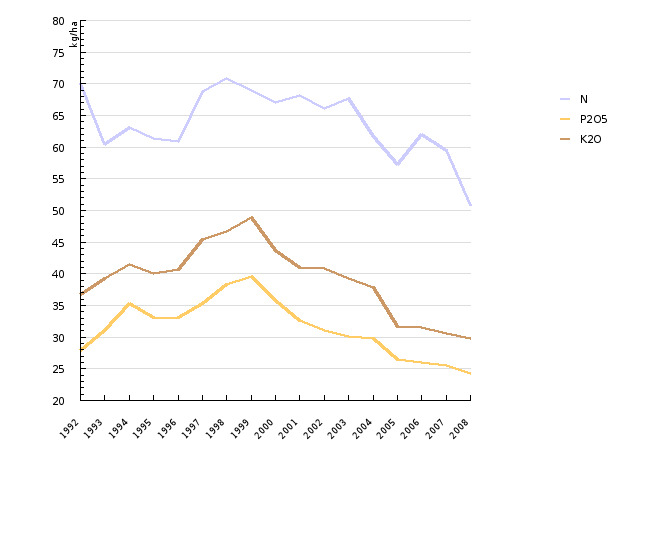 Changes in the consumption of mineral fertilisers are expressed as a percentage of the base year 1992. - Indicator advantages and disadvantages: Data on the consumption of mineral fertilisers are not collected regularly in Slovenia, since the Statistical Office RS collects them once in a year through surveys. As upon the entry of Slovenia into the EU in 2004, the circulation and the sale of mineral fertilisers marked GNOJILO ES (EC FERTILISER) within EU Member States are open, Slovenia can not hold accurate records of imports and exports of mineral fertilizers. Due to the above stated, data on the consumption of mineral fertilisers in Slovenia are to some extent unreliable, although we believe that they reflect well the reality in the field. Reliability of the indicator (archival data): Data on the consumption of mineral fertilisers are collected according to the prescribed methodology. Upon any modification of methodology, data were accordingly recalculated for the past, so we believe that the data series in the time scale are sufficiently comparable. Uncertainty of the indicator (scenarios/projections): Data on the consumption of mineral fertilisers in the years 1992-2008 can be explained quite reliably with the general situation in the field of fertilisers consumption in Slovenia, and especially with the general situation of agriculture in Slovenia (more and more difficult economy of agriculture, steadily reduced scope of agricultural production ...). We can therefore make a fairly probable forecast that the trend of reducing mineral fertilisers in Slovenia is going to continue in the next few years. Source database or source: Food and Agriculture Organization (FAOSTAT > Resources > ResourceSTAT > Fertilizers). FAO collects data on the consumption of mineral fertilisers on an annual basis and publishes them on its website. The indicator presents data for the period 2002-2007. Data are available for all EU Member States with the exception of Belgium. 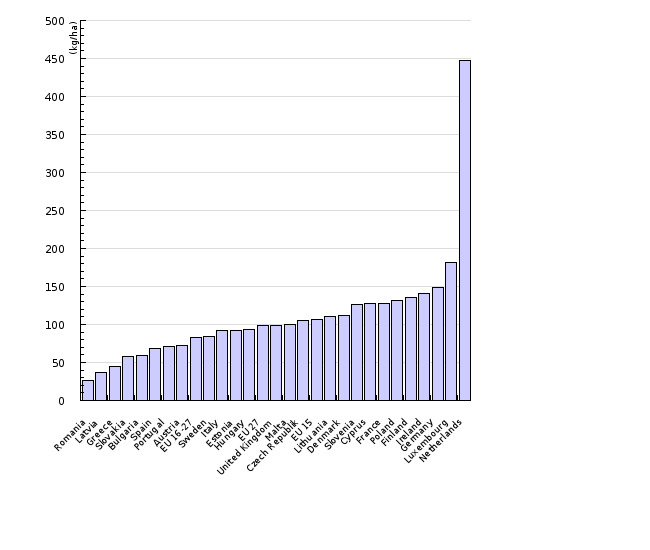 Data on the consumption of plant nutrients (N, P2O5, K2O), expressed in kilogram of individual nutrient per hectare of utilised agricultural area, are calculated on the basis of the quantity of plant nutrients used on the surface of utilised agricultural area by each Member State (EU 27). Within Member States, data from the old Member States (EU-15) were compared with data from the new Member States (EU 16-27) joining the EU after 2004. Data for particular Member States are presented in the form of tables by each particular year, and in the form of diagrams as the average in the period 2002-2007. - Indicator advantages and disadvantages: Since data on the consumption of plant nutrients by some Member States show unusually large oscillations within particular years, and since the methodology of data collection among Member States is not clearly defined, these data are less reliable in terms of comparison between Member States. Reliability of the indicator (archival data): data comparison between EU members is less reliable due to the above stated reasons. Uncertainty of the indicator (scenarios/projections): It is difficult to forecast the future trend of the indicator due to huge diversity of data among Member States; in addition, the analysed period of 6 years (2002-2007) is too short.